Is Google allowing emoji spam to take over? Earlier today Barry Schwartz reported Expedia started adding emoji to title tags in an effort to increase clicks, and Google now displays the emoji spam icons in search results. This got me to thinking – how far can we take this emoji spam? 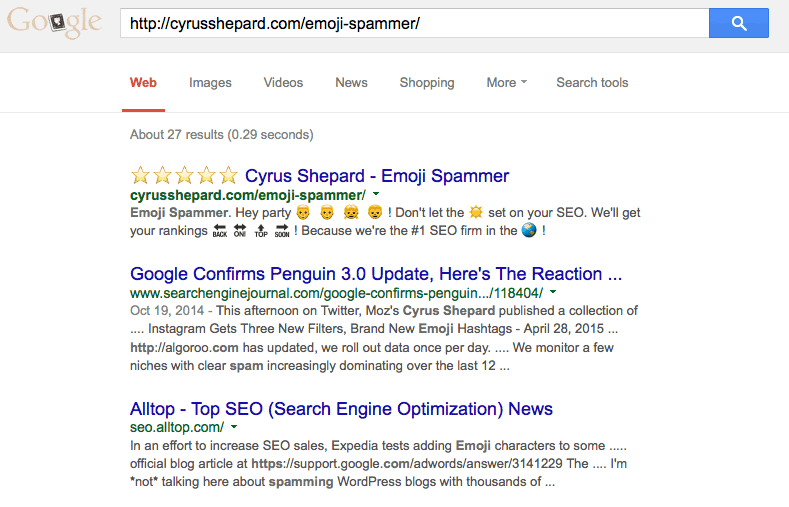 It only took a few minutes to get all of the following emoji spam into a single Google search result. 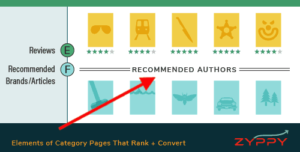 When marketers started abusing rich snippet review stars, Google cracked down by demoting abusing sites and even set up a reporting mechanism to catch offenders. There have been several reported instances of Google getting strict with review stars and rich snippet markup. Lots of folk in the SEO world believe Google doesn’t like any visual distractions to prevent people from clicking on ads. 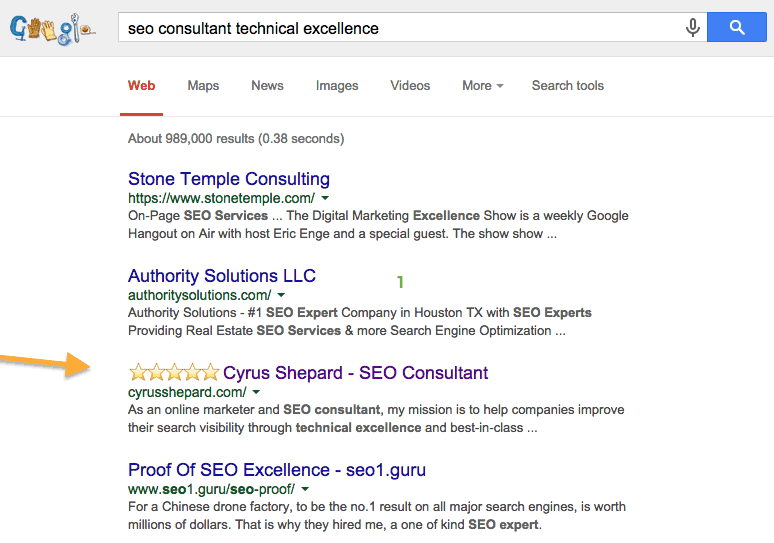 Consider the following result for “SEO consultant technical excellence“. My own site ranks #3 (behind my good friends at Stone Temple Consulting). 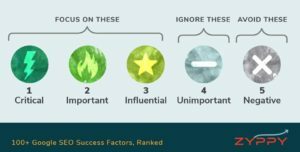 With the emoji spam added, a lot of users might be attracted to the #3 result – even though this emoji spam wasn’t earned by reviews. In this result, the 3rd position might get all the clicks. Or at least significantly more than it would otherwise! It seems unlikely that Google will continue to allow these types of results with emoji spam, and with good reason. For starters, they are incredibly ugly. They make an otherwise respectable search result look like the worst of Facebook Messenger! Hahah really hope google crawls this issue quickly before it gets out of hand. Now that the app is out, Scogin said he has received texts with SNL emojis in new ways that make sense in the flow of conversation but that he hadn’t anticipated. Well it was fun while it lasted… Is there any official update on the matter? Will emojis return? Looks like they’ve totally removed the Emojis now. Can’t see them even when searching for ’emojis’, which used to bring up loads of Emojis in the SERPs. I do most of my work in the legal space. I’m sure G will figure this out in short order. Looks AWFUL. Looks like Google has already caught on and now is only displaying the default square boxes in the Google desktop version. I am still seeing the stars in mobile though. Still working for me, although it can depend on the browser you’re using whether or not you’ll see them. I’ve heard from some folks that they just can’t see them, for whatever reason. Also still seeing them for Instagram results. They already crack down by rewriting well crafted, click inducing titles with more benign search phrases, single keywords and other such nonsense – surely with something like this they will rewrite your title to something less click worthy and give you a -50 manual action for antagonizing the big dog… It’s the only way people will learn right! Ha, that’s funny, shouldn’t take Google long to ban this.